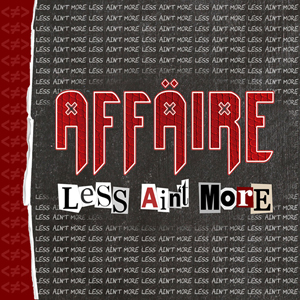 Perris Records president Tom Mathers is proud to announce the signing of AFFÄIRE to the release of their album called Less Ain’t More, out on the 19th of April, 2019. Fans of L.A. GUNS, VAIN, GUNS n' ROSES, WASP & RATT will enjoy this exciting release from a true hard rock band from the new generation. AFFÄIRE had this to say "We're so thrilled about putting our new album out there and confident that it shows a serious step up in our career. Signing with Perris Records - a label firmly established in the hard rock scene for so long and the home to so many great bands that influenced us - is a definitive move for us!" In 2019 Perris Records president Tom Mathers has found another great band from Portugal and their name is AFFÄIRE. Their new studio album is called Less Ain't More and was recorded at the Dynamix Studio in Lisbon, Portugal. The CD was mastered in L.A. by multi platinum award winning engineer Phil Brewster (SEBASTIAN BACH, THE DARKNESS, HALESTORM, RED HOT CHILI PEPPERS). The worldwide release date will be April 19th, 2019. AFFÄIRE is a band straight out of the 80's and did not follow music trends and industry dictatorship. Rock 'n' Roll doesn’t have to be self-pitiful, innocent and pale like many of the bands in the 1990’s, it is about being rebellious the motto for AFFÄIRE. In late 2011 AFFÄIRE released their debut single “Born Too Late” in 7” vinyl format, limited to 300 hand numbered copies. The band followed up with shows as the opening act for Paul Di'Anno and HOUSE OF LORDS. In 2015 the band released their debut full length At First Sight. The CD was mastered at Davy Vain's “The Groove Room” in San Rafael, California. In June 2017, the Neon Gods digipak EP CD containing 4 new songs and AFFÄIRE's very own version of THE BEATLES' "I Saw Her Sanding There" was released. Both releases have attained remarkable airplay and gathered rave reviews from specialized media worldwide such as Metal Temple, Sleaze Roxx and Hair Band Heaven to name a few.